Ric and I were looking at them earlier - my stroke rate is mental at the end! Mark - I thought that too! It's interesting how different our races are in terms of stroke rate and power ratios. These are fascinating. As a stats junkie I can never get enough data. Is this the sort of data you get if you have a C2Log card and reader? More importantly for me, though - I have no idea how you guys generate so much power per stroke. I find it impossible to keep the rate down if I pull at "full power", such as it is. And if the rate goes too high, I explode due to lack of lungs and through overheating. 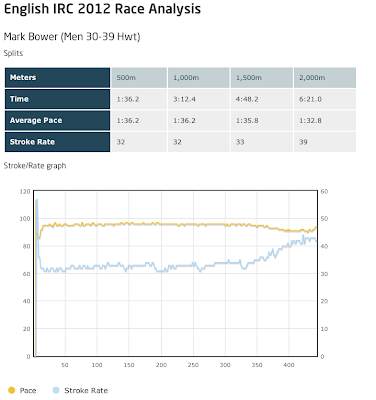 Hi David - these are the stats from the race machines, it's not quite the same as the data on the logcard. 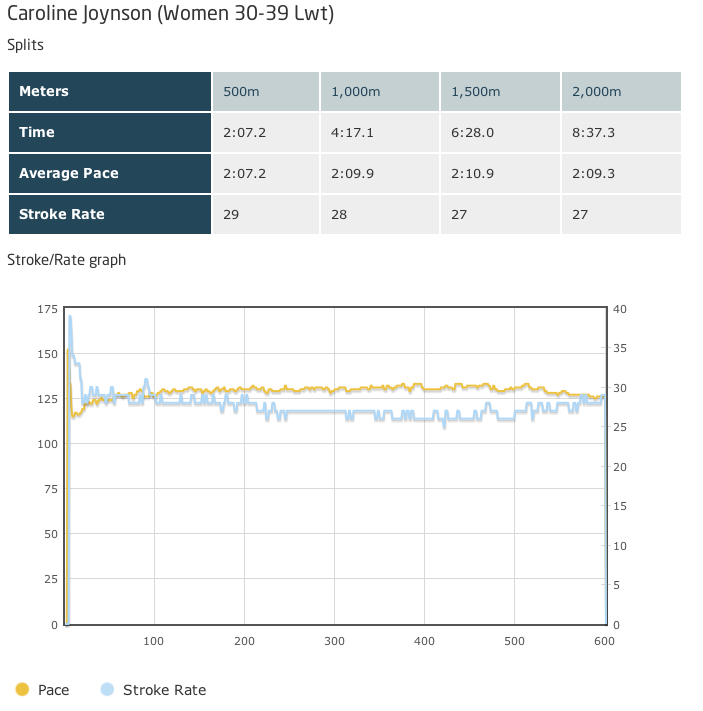 The erg records data 3 times per second and that allows C2 to plot these graphs, but the logcard just shows you the data as you chose to split it. I think rowpro might allow you to get more data out the backend, I don't use it though. Regarding rate, I always struggled myself, but the more I trained the better I got. 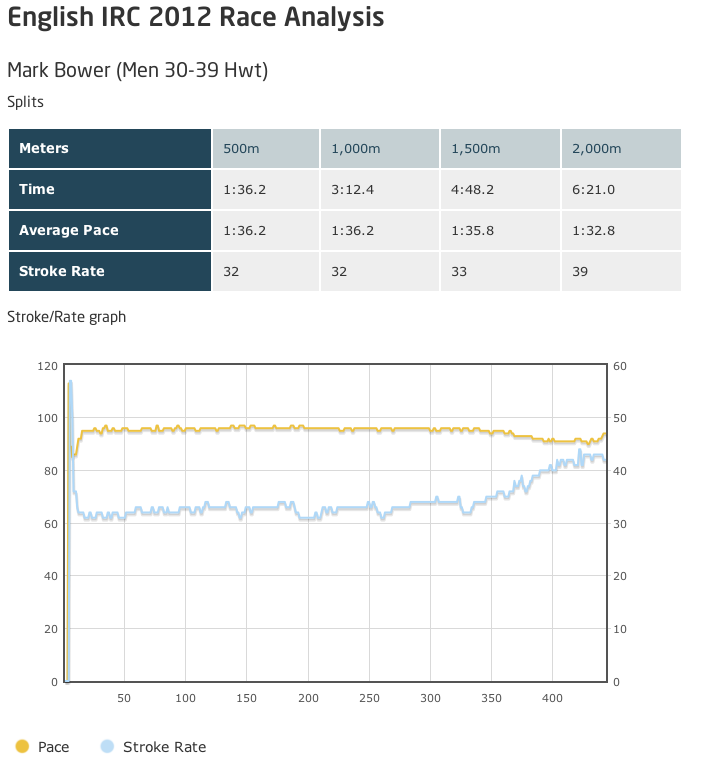 It's important to keep the drag factor down - it's not about rowing on '10' all the time. I row mainly on a drag factor of 120-130, more 130 these days, and as part of my training plan I have to do rows in the various ratings, down as low as 18-20. I used to do everything at 30+, but doing the low rate work really builds up the strength, and I find I enjoy it (a little bit!) more. Thanks Mark. So far, using a lower drag factor has had me pulling more rapidly and feels unbalanced. I guess that's a technique thing. I guess I'll have to work on that - it's going to take much more out of my upper body/core I think, which would be no bad thing. I have worked really hard on totally changing my stroke rate over the last 3 years. In competitions it was as high as 40 stroke rates per minute and now as you can see on my graph I have got it down to under 30. I Aim putting much more power in with my legs and finish the stroke with a slightly angled back. Although its not a perfect technique ( I need to work on keeping my knees straighter - they are wobbling all over) I have improved my time year-on-year since slowing down my stroke rate.